The regeneration project for the St Symphorian’s complex is moving. So much work has already been completed. A huge amount has been achieved through the work of professionals and volunteers. This has been financed through grants, fund raising, appeals, donations and in particular through the people giving their time and talents to the work of the Church. People care about the buildings for many reasons. What is important is we remember our buildings, just like all other churches, stand in the same place both day and night as a constant reminder of God’s presence at the heart of the community. Before we look at the actual work, we should consider why we are doing this. It is true that the Church does not need a building, but when we have buildings they constantly speak for us. Therefore, looking at the St Symphorian’s Church Complex. What do they ‘say’ to you? Do the buildings give the same message we try to give when we meet people face to face? Do they offer that same smile? Do they proclaim the Gospel? Or do they look tired and in need of much tlc? When we are not there to offer that welcoming touch, our buildings are. Many people sit outside them or use the paths as a cut through. But each and every time they do this, they see the buildings and noticeboards. So what do they see? The next projects in the regeneration programme are set out here. They are in no particular order of importance – that is left to God to decide – it is He who has, and will make all things possible, but we shouldn’t forget we need to do our part too. It is important that each step of the regeneration programme is prayerfully and carefully thought out, ensuring we don’t take quick fixes but look to the future. Yes, it may not be the cheapest way and money is tight but if we are following God’s vision the money will follow – that we already know for sure. Over the last few years a number of projects have been completed. The first phase of the roof retiled on the south slope, the Baptistry and half the Lady Chapel. 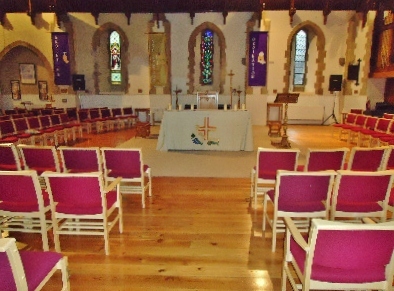 In 2013 the nave of the Church was reordered with the pews being removed and new chairs have been installed. The emphasis was on versitility, opening up the possibily of the Church being used for more activities than just worship. This would enabing the Church to once again take its place at the heart of the community. The new chairs were partially funded through a grant from the Garfield Weston Foundation. The reordering of the Church focused on versitility, opening up the possibility of the church being used for more activities than just worship. This would enable the church to take its place at the heart of the community once again. The church is now regularly used as a rehersal venue for a local community choir. We hold concerts and have provided facilites for trainings and conference meetings. A new lighting system was installed in 2013 for the Nave, Baptistry, Lady Chapel and Porch. The lighting in a building like this sets the scene; can create atmospheres and can make such a difference. The versatility off the Church lends itself for so many different forms of worship and potentially other activities. it is important that the lighting system is updated. With the new system will come emergency lighting which is required by fire and health and safety regulations. This projected was financed from the Sharp Legacy Income. The Church roof still leaks. We have potties all over the place. We need to look at the different options for the next phase of the Church Roof which will be the remainders of the Nave Roof and the Chancel Roof. As well as renewing these different areas, insulation will also be installed helping save on our energy consumptions and hopefully making a difference to our bills – at least they may not go up as quickly. The First phase of the Church Roof Project was financed through substantial grants from English Heritage, Viridor Credits (this source is no longer available in our area) and Allchurches Foundation. The vestry roof was updated in 2015. The store room roof will be upgraded during 2016. These are funded from the Sharp Legacy Income. The sound system was updated in 2013. There are still issues with the system and new, improved speakers may be required. A refreshments areas has been created in the Baptistry area at the west end of the Church. At present this provides tea and coffee facilities. The addition of hot plate unit in March 2015 enables food to be kept warm and meals to be served in the Church. During 2015 a commercial dishwasher and sink area was added to the vestry areas making catering for refreshments far easier and enabled Messy Church to operate in the church. The Church needs repainting and this is a professional job – not to be undertaken by volunteers. We have problem walls where damp has caused the paint and plaster to come away from the walls. We need to protect the 13th century walls that remain so we have to make sure we cover them with the right materials. Not only does redecorating make the place look great but helps to preserve the fabric of the church. Before redecorating it is important that most of the other projects are completed first. This will be the icing on the cake but will be pointless unless the water ingress is prevented from the roof, through blocked downpipes, and through the walls. CCTV may be installed to protect the Church from vandalism and theft. We have one of the largest halls in the area making it the ideal venue for parties, functions and meetings. In this hall we offer the use offer the use of children’s tables and chairs as well as adult chairs and tables. The new 80 folding chairs were funded by a grant from Worthing Community Chest. This hall is in regular use by the local community for different groups from short mat bowls to the Guiding Association, Legs Bums and Tums, Rubytots and Pram and toddler groups. In addition there is a smaller hall called the Atkinson Room which is fitted out as our community café. This is an ideal place to come for a quiet coffee on weekday mornings, or hire for small social events and meetings at other times. On Wednesday mornings and Thursday afternoons this area is turned into an internet cafe where people come to improve there computing skills! Again lots of work has already been achieved in the church hall. The café area was renovated with windows being closed off and a lighter feel given to the place through new decor and furniture. In the main hall the stage was removed to make way for new storage and to enable easier access to be achieved to the rear rooms. The old storeroom has been converted into the Parish Office with a new entrance directly opposite the Atkinson Room entrance. Total renovation of the hall kitchen was started in November 2011. This included the knocking down a connecting wall between the Atkinson Room and the existing kitchen, and the building of a counter area. New cupboards were installed as well as cooker, dishwasher, fridge and freezer. The kitchen area is just being completed with the addition of the new canteen shutter and new fire doors. All this complemented the new café area developed in 2010 which was funded by a grant from the Co-operative and a NHS Wellbeing Grant. If the floors in the old office areas in the main hall need to be lowered to the same height as the rest of the building, new storage areas could be developed. This area at present is a dumping ground and better use of the space could be made if access was made easier. Pram and Toddler Group have worked hard to provide good storage for their equipment by purchasing new storage equipment but more is needed. There is considerable height in this area and, once the floor is lowered, shelving could be erected, providing a huge amount of storage capacity. The toilets at the south end of the hall were refurbished in 2013 providing a disabled toilet with baby changing facilities and 3 unisex toilets. This was funded through a £10,000 grant from the Big Lottery Fund and local fund raising. The toilets serving the Atkinson Room are still in need or refurbishment. Once the flooring in the old office has been lowered, the toilet by the Atkinson Room entrance could be developed into a disabled toilet relatively easily. The wall could also be opened up and access to the currently hidden toilet in the old offices could be gained thereby providing addition facilities. This is all dependent on the lowering of the storage rooms’ floors and putting a lintel into the new toilet area. The windows in the main hall were replaced in December 2015 at a cost of £8,800. This has been funded by a grant from the Big Lottery Fund of £10,000. The remainder of this grant will be spent on the installation of aramp for the fire exit and to replace the fire exit door on the west side of the hall.. Allchurches Foundation has also given a grant of £1,000 for the replacement of the windows at the south end of the hall. These need to be wooden frames due to planning restraints. There have been several plans for a disabled entrance to be built which would give direct access into the main hall. These have included ramps to the fire exit on the side of the hall and a very elaborate ramp to the new Road entrance. Recently we have been thinking about installing a new doorway between the two windows in the north side of the hall in the old office area. This would require the demolition of the partition wall between the two rooms and two stud walls being erected. The two new rooms would become storage areas, one of which would become a mini print area. Some sound control needs to be installed in the café area. There are very few power points in the main hall. Rewiring is necessary especially for hiring out the Parish Centre.